Dom Cambareri is not only a sponsor, but our league president and father to two players. He took over leadership of Challenger Baseball in 2004. Since then the league has grown from 60 players to over 280. He along with his brother run Cambareri and Cambareri from their office in downtown Syracuse. 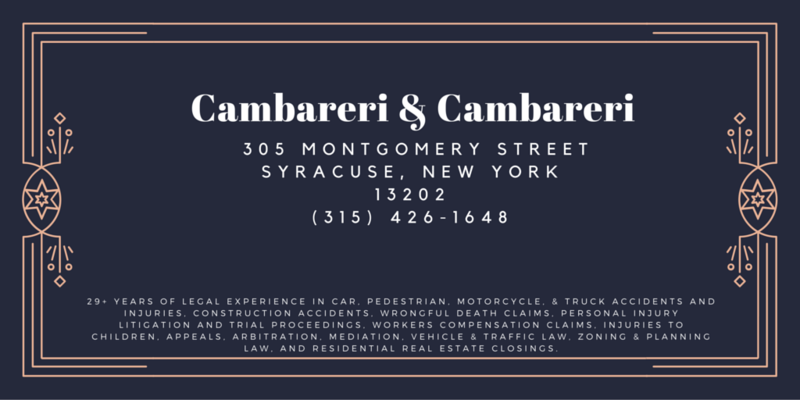 With 29+ years of legal experience in car, pedestrian, motorcycle, & truck accidents and injuries, construction accidents, wrongful death claims, personal injury litigation and trial proceedings, workers compensation claims, injuries to children, appeals, arbitration, mediation, vehicle & traffic law, zoning & planning law, and residential real estate closings, you can trust the Cambareri firm to handle your legal claims.